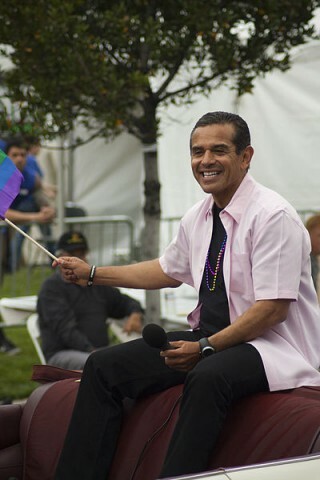 #118 – Mayor Antonio Villaraigosa! HEY, I’ve said it before and I’ve said it again: This is not a political blog! —Actually, my attorney’s on vacation this week, sure, and his paralegal is frantically waving her arms and telling me that the laws regarding elected officials and libel are, eh, difficult to interpret, so we’ll just say, for now, that, in my First Amendment-protected opinion, Mayor Antonio Villaraigosa is #118 on a completely non-sequentially numbered list of an arbitrary total number of 857 reasons to get the hell out of the filthy toilet that is Los Angeles or not move here in the first place. If it weren’t completely non-sequential, he’d be closer to number one. In my opinion. …My mailbox is filling up almost quicker than I can empty it. 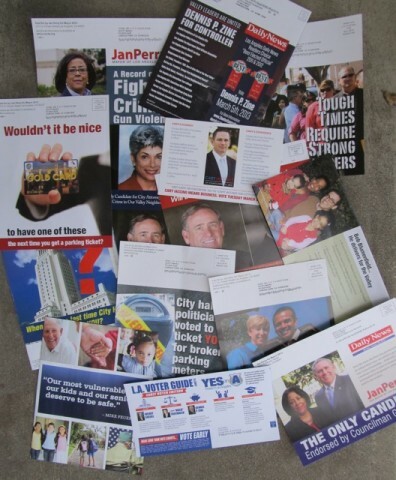 That’s four days worth of political flyers, and we’re only getting started. But the good news is that among the offices we’ll be voting for is that of mayor of Los Angeles. Villaraigosa is thankfully termed out and so his reign of embarrassing douchebaggery is near an end. But before he’s hopefully irrelevant**, I wanted to note what an awful mayor this former gang member has been, and thus has been a perfect fit for L.A. Considering he’s served two terms – that the city saw how much of an opportunistic, preening jackass he was during the first four years, and yet he was voted in again – this city deserved him. Have I written anything considered libelous? I hope not; I don’t want Tony suing me. Not him directly, of course – an attorney working for him, I mean. For him to sue me by himself, he would have had to have passed the California State Bar on one of his four attempts. But what better man to represent the filthy toilet that is Los Angeles, than Antonio “We Clean Your Toilets” Villaraigosa holding court wielding a toilet brush as a scepter? …which would have been an awesome way to end this post if I knew how to Photoshop a toilet brush in his hand. *Well, aside from partying with Charlie Sheen or giving LA a final F-You by supporting another increase to our ridiculously high sales tax. **That is, if Obama doesn’t see the irony in naming the mayor of a city with notoriously bad traffic the Secretary of Transportation. Posted by Ted on February 20, 2013, 12:00 PM.